In your golf career, have you ever played golf in the company of deer, mouflon, rabbits and peacocks? Have you ever putt on sand greens? If you are looking for a completely new experience for playing golf, then the Brijuni golf course should definitely be your next destination. On Brijuni golf is played on a unique golf course dating from 1922, which then acquired the flattering title of one of the largest and naturally most beautiful golf courses of that time. But, what most attracts golfers to Brijuni is the unique setting and atmosphere of this golf course. On the reconstructed 18 holes of the onetime largest golf course in Europe, you can still experience the enchantment of playing amid untouched nature. This rightfully dubbed environmental friendly golf course is truly impressive. The golf course is maintained without any machinery, no pesticides are used, it is not even watered so that greenery of the golf course depends on weather conditions. In the tranquility of the southeastern part of the island there are 18 green hole numbers (PAR 71, SSS 71) length 5,486 meters (ladies length 4.977 meters). The course is not too demanding, so that it is available to all sorts of players (recreational players and the golf champions). Fairways are large so there can be different game errors. There are different hazards such as bunkers, woods and single trees, bushes and also water hazard. How to reach the golf course? At the Brijuni Tourist Service office in Faana you should buy a ticket (green fee) for the golf course and get on board the boat. After having arrived in Brijuni harbor, take the road to the right, behind the Hotel Karmen. Following the road along the coast, after some 500m, you will first notice the green hole number 12 on your left side. Continue along the road by the sea, cross a little bridge over a fishpond, and you have reached the golf course. You will first notice the green hole number 9 on your left side. On your right side, after the green hole number 8 youll see the Golf House with the bar, reception and the dress room. The starting positions for the first hole are on the right side of the road. When to come and play golf? Unlike most golf courses in Europe, here golf can be played all year round. Whenever you decide to arrive, the temperature is always pleasant, since even in January it rarely drops below 0o C. In winter the cold wind bora sometime blows, but this will not stop you from enjoying your game. Depending on the amount of rain in summer the grass sometimes turns yellow, however the local rule (moving the ball is allowed) enables you to continue playing golf. One thing we can tell you for sure is that whenever you decide to come here, peace and tranquility await you. Sometimes you will even be alone on the entire golf course which is certainly a unique experience. You can rent the complete golf equipment and get all the information in the Golf House. Golf club (right, left and for ladies) golf bag, golf trolley and golf balls for exercises are also available. You can buy all the necessary golf equipment in our Proshop. The most important thing when you get to our golf course is to forget your HDCP and the result you are aiming to. Just relax and enjoy in the unique lay out that attracted the European aristocracy even 80 years ago. Fažana has a long fishing tradition, is proud of the atmosphere where every guest becomes a neighbor and friend! Place Fažana is located near Pula. 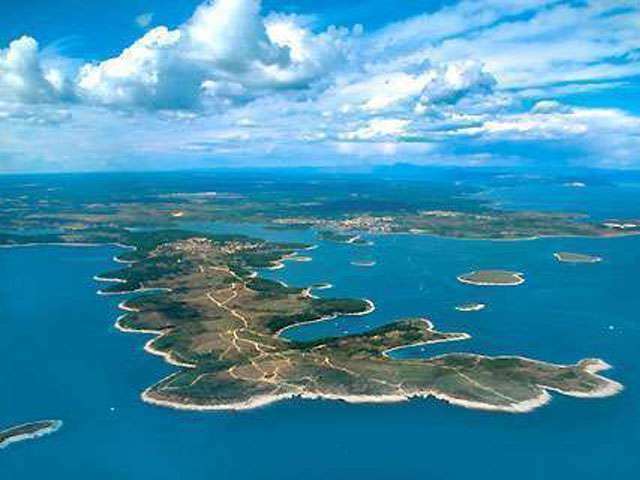 Fažana is the starting port for the Brijuni Islands - The National Park with the attributes of paradise. Fažana, with its beautiful natural beaches, pine forests, seaside promenades, restaurants, is a perfect place for a family vacation.